Discover a Sarasota kayak tour at The Exotic Mangrove Tunnels. A family friendly activity perfect for all ages! 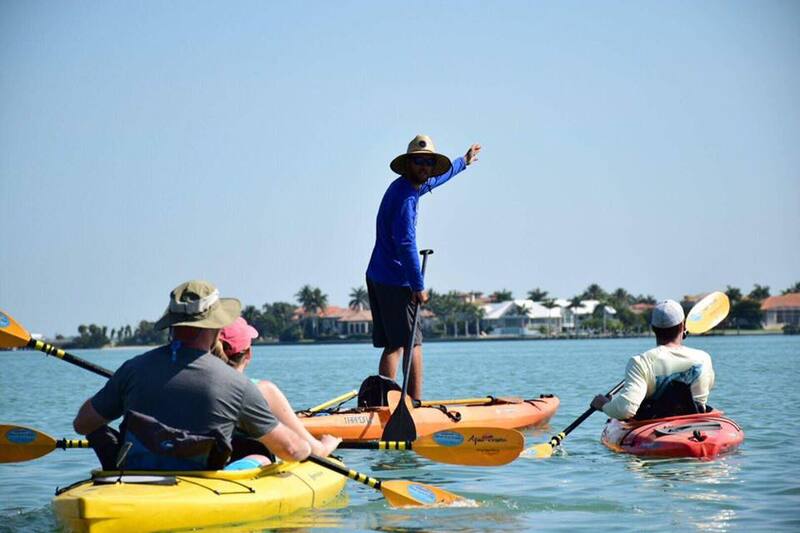 Experience our Sarasota Kayak Tour and meet the manatees, wave at the dolphins swimming along side your kayak and watch the local birds absorbing the warm Sarasota sunshine. The Sarasota Kayak Tour is a relaxing activity to share with family and friends while vacationing in the Sarasota area. The Sarasota Kayak Tour departs twice daily, the first kayak tour is 10 A.M. and the second kayak tour departs at 2 P.M. We have single kayaks and tandem kayaks with very comfortable seating and lightweight kayak paddles to make your Sarasota Kayak Tour the most enjoyable vacation activity ever. Adventure Kayak Outfitters tour guides are from Sarasota and know the local sea life patterns well. The Sarasota Kayak Tour is a kayak adventure in paradise only a few minutes from downtown Sarasota. The Siesta Key Kayak Tour launches from Turtle Beach Lagoon at the south end of Siesta Key. The tour departs with a paddle out of the lagoon and into Little Sarasota Bay. The attraction of this tour is the Jim Neville Marine preserve, a small island with a mangrove shoreline and adjacent grass flats where wading birds and nesting birds are a common sight. This tour location is more open water where boat traffic is prevalent and protection from wind is minimal. For the safety of our guests we only run this tour when conditions are ideal. The Myakka River Alligator Tour departs from the famous Myakka River State Park in Sarasota county. Alligator sightings are so common we guarantee you will see many large alligators. Along the banks Myakka river while on this tour, you may see several different species of wading birds, whitetail deer and wild pigs. Look up in the sky for bald eagles, snail kites and swallow tail kites too. The water levels on this river fluctuate greatly and for a quality kayak tour with lots of wildlife sightings we only launch at optimum water levels. Adventure Kayak Outfitters of Sarasota offers professionally guided kayak tours throughout Sarasota county. Tours are minutes away from Bradenton, Anna Maria Island, Longboat Key, Siesta Key, Lakewood Ranch, and Venice. All Kayak tours take place in Sarasota county and are permitted through Sarasota County Parks and Recreation Department.